If the goal of the Boston bombers was to defeat the human spirit, clearly marathon runners were the wrong group to target. They accomplished nothing with their cowardly explosives last year. They did not weaken us by their senseless act, but only made us stronger, more fierce, determined and connected. They didn’t scare anyone away, but instead bolstered an endless pool of support for Beantown and every other major marathon city out there, inciting legions of runners from all around the world to train harder just to qualify for Boston this year. 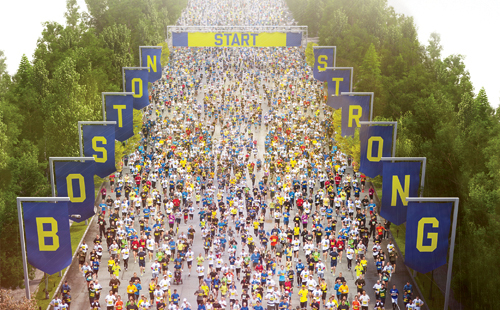 On April 21st, thirty-six thousand runners, the largest field ever, will run the Boston Marathon, despite the bombers. And not one person will give them a moment’s thought. They will be busy celebrating the honor of running in one of our sport’s most prestigious races, and reveling in the joy of being part of one of the strongest and most supportive communities around. I still can’t help wonder how different the bombers’ lives might have been if they had been runners—if they had been zealots of adrenaline rather than zealots of hate. Perhaps they never laced up their shoes because they felt they wouldn’t fit in. They would have been wrong about that, though. There’s room for everyone in the running community. You see, we are old farts, young farts, and every kind of fart in between. We are yuppies, scuppies, hippies, and buppies. We are Boomers, Boomerangs, and Generations X, Y and Z. We are you. We are me. We are Muslims, Buddhists, Hindus and Jews. We are Christians, Scientologists, and non-believers too. We are gay. We are straight. We are rich. We are poor. We are smart, and some, even thick as a door. We are teachers, preachers, writers and baristas. We are truck drivers, trash collectors, soldiers, and zookeepers. We are funny. We are serious. We are quirky and sweet. We are hipsters, we are nerds, and teens who like to Tweet. We’re the guy next door, the granny at the store, the pregnant chick in yoga pants, the kid blazing in an iPod trance. We are underweight, overweight, tall, short, round, and square. We come in every color. No one ever cares. We’re organic, synthetic, flamboyant and drab. We are natives and immigrants, and all who need to work on our abs. We are liberal, conservative and anti-government too. None of it matters when lacing up our shoes. We are fast. We are slow. Some don’t even care to know. We are bald, gelled, dreadlock’ed, and ‘tailed, wearing good luck get-ups we hope will never fail. We are Valedictorians and PhDs. We are high school dropouts and wannabes. We are high-powered and low-powered, all just out there celebrating our Go Power. We each know heartache, frustration and every kind of pain, but we leave it on the road whenever we train. No need for shrinks. No need for pills. All we need are a few good hills. We’re all as different as can be; that’s what makes this strong community. We run for health, we run for pride, we run for sanity and to feel alive. Unfortunately, Boston bombers it’s too late for you, but if anyone else is contemplating a senseless act like this, do yourself a favor: instead of wasting your potential, run. That’s right. Put down your arsenal, lace up your shoes, and run. Run until your lungs burn. Run until your muscles ache. Run until you can’t take another step. You will suddenly understand what it means to be a human being. You will feel strong. You will feel alive and you will feel empowered. That’s right. Just. Freaking. Run. And I’ll be cheering on every single runner in the race . . . . I love the spirit of your new blog, in general, and this post in particular. You and I will both be cheering, especially since many of my friends have earned the honor off running Boston this year. Thanks or swinging by to check out my new digs. I know you traded in running for yoga a while back, but once a runner, always a runner at heart.